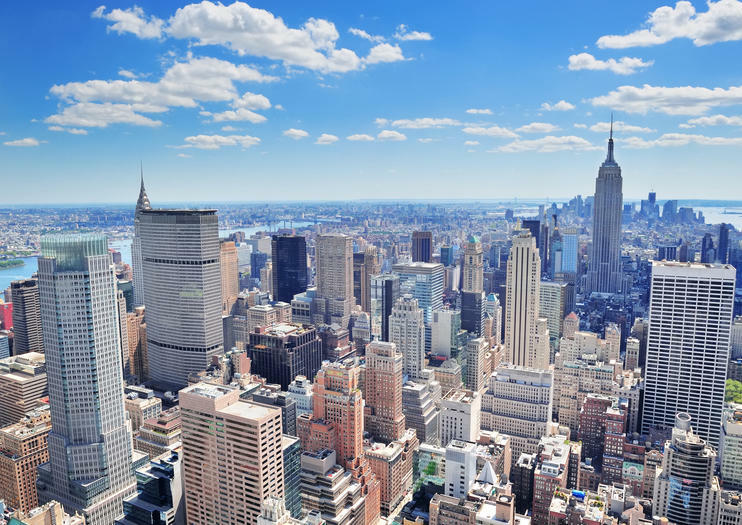 One of the world’s great metropolises, New York has something to offer every traveler, from world-class theater and art to one-of-a-kind attractions and a whole host of architectural wonders. Here are some options for your 3-day tour of the city, including a boat cruise, Broadway show, day trip, and more. Start day one by stepping aboard a sightseeing boat tour around Manhattan, cruising by key NYC landmarks such as the Statue of Liberty, One World Trade Center, and Empire State Building. Some cruises include onboard food, drinks, and music. If you prefer to stay on dry land, choose a hop-on hop-off tour bus instead. Both are great ways for first-timers to get an overview of the city. Next, check out New York’s hippest borough: Brooklyn. From the Financial District, walk the Brooklyn Bridge on a guided tour to the Dumbo neighborhood, where you can stroll along the East River waterfront and discover beer bars, galleries, and farm-to-table restaurants. Return to Manhattan for a walk through Times Square on the way to see a Broadway show. Kick off another day of NYC exploration in fashionable Chelsea. Go to foodie favorite Chelsea Market for breakfast and swing by the Whitney Museum of American Art to see works from American greats. From there, take a guided tour of the High Line, a public park built on an elevated railway track along Manhattan’s West Side. Then, hop on the subway to the Grand Central Terminal train station, which also hosts gourmet eateries and shops. Afterwards, walk up Fifth Avenue to Central Park to stroll, rent a bike, or go on a pedicab tour. Top off the day with a nighttime bus tour to see NYC at its glittering best. With NYC’s seemingly bottomless array of attractions and experiences, most travelers never get beyond the boundaries of the five boroughs. Take a day trip to Long Island’s rural North Fork peninsula, where vineyards and roadside farm stands abound, or get your fix of fresh air and nature on a cruise up the Hudson River to Bear Mountain. This state park is especially scenic in fall when colorful foliage arrives. If you prefer exploring cities, Philadelphia, Washington DC, and Boston are all accessible by day trip. Soak up the Big Apple with brunch, bottomless mimosas, and live jazz on this 2-hour boat cruise. Sail around the island of Manhattan and New York Harbor, passing highlights such as the Statue of Liberty, One World Trade Center, the Brooklyn Bridge, and more. While you sightsee, help yourself to drinks and a delicious afternoon brunch on board. See world-class collections and special exhibitions in the heart of New York City’s Meatpacking District with admission to the Whitney Museum of American Art. Explore the 220,000-square-foot (20,000-square-meter) space at your own pace, and take in a permanent collection that includes pieces by Edward Hopper, Andy Warhol, Georgia O'Keefe and many others. Catch temporary exhibits from around the world as you visit stunning natural light filled galleries and enjoy sweeping views of the City skyline from the museum's outdoor terraces. The Museum is located just steps away from the High Line, Chelsea Market, Hudson River and other popular downtown attractions.Please Note: The Andy Warhol From A-B and Back Again exhibition is included with your ticket from November 12, 2018 - March 31, 2019. Taste your way through Grand Central Station on a 2-hour foodie walking tour of the world’s largest train terminal. Discover Grand Central's hidden gems and architectural highlights on your way to a series of gourmet stops, where you’ll sample New York City treats with a food-loving guide. Tour the city of New York lit up for the night on this 2-hour Big Bus tour. Find a comfortable seat on one of the two decks and listen to the recorded commentary in any of 10 languages while you take in the sights.